It’s been several years in the making, but British furniture designer Timothy Oulton‘s flagship restaurant has finally opened on eclectic Gough Street, a few doors down from his retail store which opened in 2012. It’s perhaps a testament to the brand’s discerning taste that Gough’s on Gough had an extended development period in which every detail was meticulously thought out, from the dazzling interior pieces (all made in-house) to the menu concept (Modern British with a touch of exoticism from far-flung countries like Peru). The result is a restaurant that feels every bit as artisanal and handcrafted as the exemplary pieces of furniture that the Timothy Oulton brand is built on. 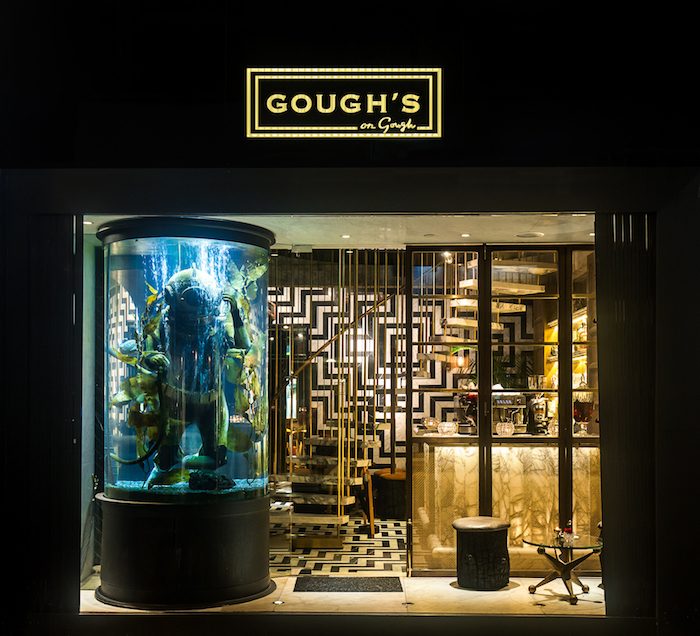 After a visit to Gough’s on Gough in which we were highly impressed by the service, design and food, it’s safe to say Timothy Oulton has made the splashy debut in the dining world it was hoping for, while simultaneously giving Hong Kong one of its most exciting new openings of the year. There are many signs that Gough’s on Gough isn’t your average restaurant, but perhaps the most compelling greets you at the door: There, floating in a large aquarium is a life-sized antique deep-sea diver, complete with a 1940s vintage helmet protecting it from the gold-flecked live piranhas that dart around the underwater plants. It’s certainly not your typical restaurant entrance décor. It’s hard to miss the one-of-a-kind entrance. Inside, it gets more extravagant: a winding gold and marble staircase leads the way upstairs, where you’ll find the opulent bar, a lounge area and the main dining room. 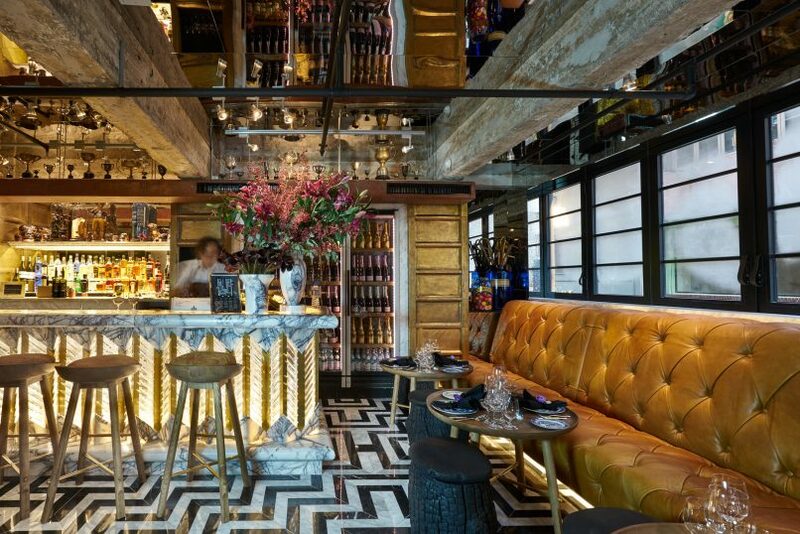 The juxtaposition in materials, textures and detailing makes for a mesmerising setting: Leather-wrapped columns are criss-crossed with strings inspired by boxing gloves; Roman-style, black-and-white-patterned marble covers the floor; and hand-buttoned, deep-tufted, tan leather banquettes are as comfortable as they are luxurious. This all unfolds under a ceiling made of century-old reclaimed English timber and a glittering crystal chandelier harkening back to 1960s Venice. 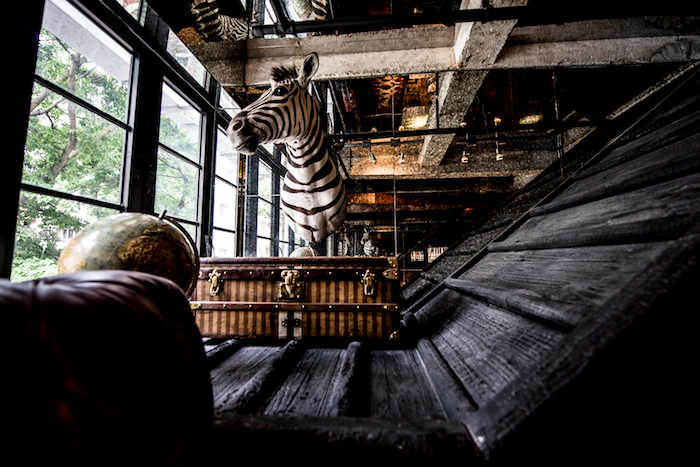 The upstairs bar and lounge area showcases Timothy Oulton’s design. And we haven’t even arrived at the two major focal points of the design: The first is a wall composed of panels of goose feathers, which flips to reveal oyster shells or leather panels depending on the general mood and time of day; the second is a back-lit Italian moonstone bar featuring 495 herringbone baguettes made of optical glass, which refract the light like shimmering crystal pendants. In case you had any doubts, this is where you’ll want to start the night. A private dining room inside Gough’s on Gough. Pull up a seat at the marble countertop and peruse the short but sweet cocktail menu, with spirit-strong tipples evoking the same old-school glamour as the barmen who stand straight in their pristine white blazers with single red roses stuck in the lapels. It’s a romantic illusion that effectively whisks us to another time and place (although the spell is ever-so-slightly broken when we overhear one of the barmen worrying over the premature wilting of his floral piece). But on to the cocktails — the Pear Negroni (HK$110) is as good as any we’ve had around town, a refreshing riff on a classic made with Mathilde Poire pear liqueur and Kamm & Sons, a British botanical aperitif. Served in a crystal-cut tumbler, it nails the precise balance of sweet and tart, with a general smoothness that slips too easily down the back of the throat. 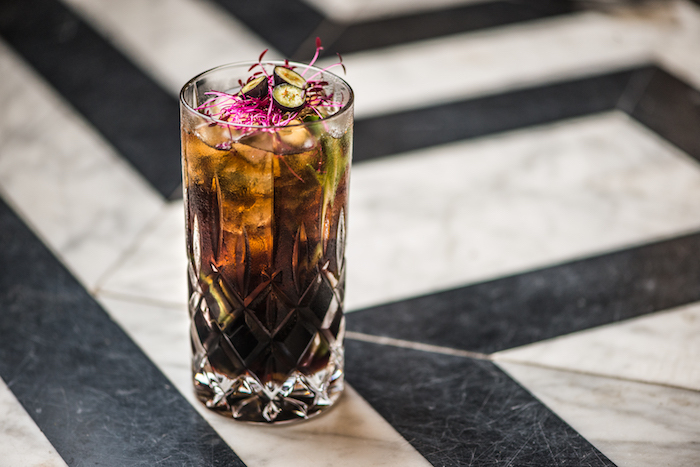 The Roots of Manchester features Aylesbury Duck Vodka, dandelion, burdock and blueberry. Other libations follow the same straightforward formula of good spirits and minimal garnishes — a refreshing departure from the overly complicated (and often watered-down) drinks masquerading as high-quality cocktails around town. You can’t really go wrong here, whether it’s the Mayfair Cocktail (HK$100) made with vanilla-infused vodka and apricot brandy; The Roots of Manchester (HK$100) with Aylesbury Duck Vodka, dandelion, burdock and blueberry; or the Sparkling Amaro Sour (HK$100), which gets its kick from star anise. When it comes to dinner — unless it’s a matter of food allergies or diet preferences — you’ll want to go straight for the tasting menu (HK$988). 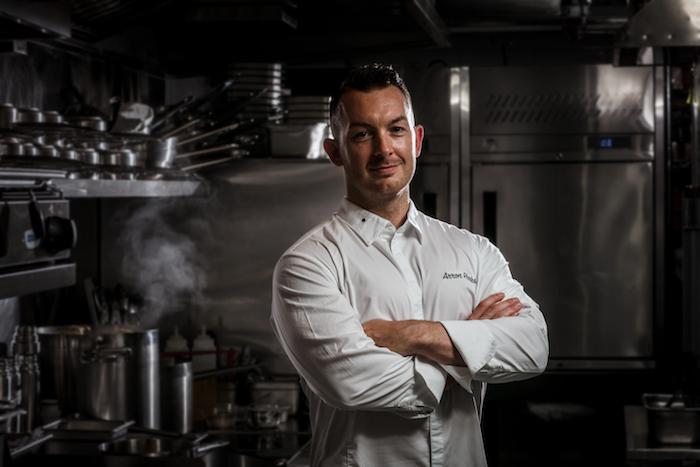 Carefully calibrated to leave you satisfied but not stuffed, the 8-course menu incorporates the best of chef Arron Rhodes’ international culinary background, with sensible portion sizes and a thoughtful progression of flavours. There’s also an optional wine pairing which is well worth the added cost (plus HK$440), featuring some fine bottles from Burgundy and Bordeaux. The meal begins with a series of amuse-bouches. The trio of amuse-bouches sets the tone from the get-go. There’s beef tartare that’s wrapped in a cylindrical crêpe, dusted with shavings of beef heart and served on a tree-bark board in a ring of bright green moss. The flavours are clear and precise, with egg yolk adding a bit of creaminess to boost the richness of the bite. Next is a miniature baked potato bubbling with melted cheese; it’s delicious, but what’s more exciting is the bed of crispy squid-ink rice scattered across the plate like black Rice Krispies (this could have been purely for decoration but we couldn’t help scooping it up by the spoonful). 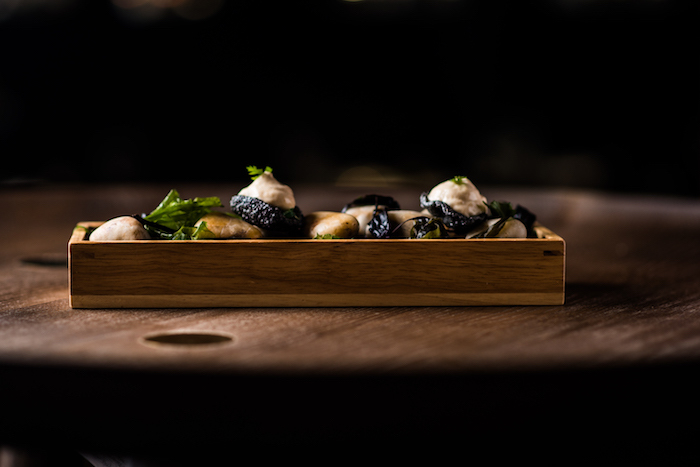 Finally, cockles smothered in a brown crab mousse are presented on a squid-ink tart — a burst of oceanic flavour which transports us straight to the sea. A Peruvian-inspired dish of corn and avocado. Chef Rhodes spent time in Peru just before settling in Hong Kong, and the next dish is inspired by his time there training under chef Virgilio Martínez Véliz at Central Restaurant (currently #5 on World’s 50 Best Restaurants). 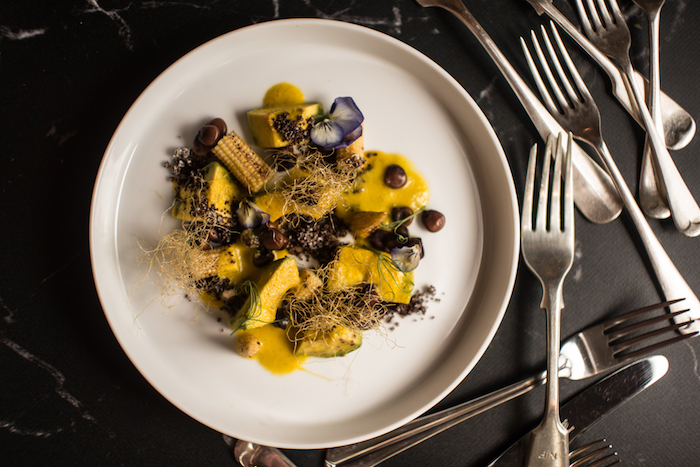 The summery plate features burnished baby corn paired with creamy avocado in a zippy leche de tigre marinade, with crunchy kinawa (quinoa’s darker and sweeter cousin) adding texture, and purple Peruvian corn adding a pop of colour. The final touch is a glass-like sheet made of corn husks, which shatters at the touch of a fork. 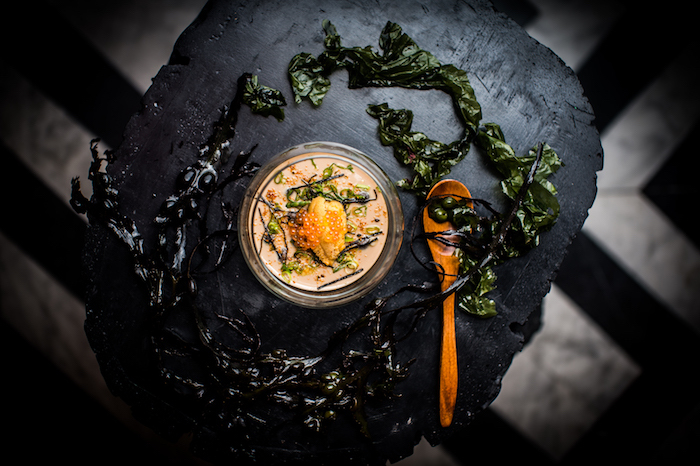 A dashi-infused custard topped with sea urchin and trout roe. Next we travel to Japan for an upgraded version of chawanmushi, which ends up being our favourite dish of the night. A silky-smooth custard is infused with dashi stock and teriyaki, topped with creamy lobes of sea urchin and saline pops of trout roe. The umami-rich dish evokes the richness of foie gras with its supple texture, but with a lightness and brightness imparted by premium ingredients from the ocean. 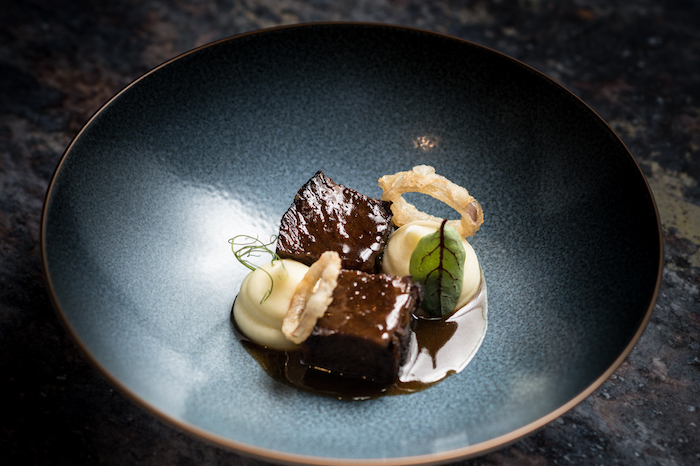 A dish of braised short rib with rings of fried shallot. Two beef dishes arrive next in succession: First, a cube of braised short rib flanked by tempura-battered shallots, looking like miniature onion rings; next, a slab of medium-rare New England sirloin sitting in a pool of creamy mash, with a decadent boulangère potato that’s been crisped and caramelised at the edges. Chef Rhodes judiciously presents the wild Scottish salmon as the last savoury dish, bringing our palate back down to earth with a light curry sauce and an herby breadcrumb topping. Like the beef courses, the two desserts are similar in composition, although we can hardly complain as both are spectacular. The first features a quenelle of lychee sorbet ringed with passion fruit mousse, creamy mascarpone, mandarin crisps and gingerbread crumbs; in the second, the lychee has been replaced with strawberry sorbet, accompanied by fresh fruit, dots of vanilla custard, sticky honeycomb and a sprinkling of strawberry dust. Finally, a selection of dainty petit fours to send us on our way: roasted hazelnut chocolates, dark raspberry chocolates, homemade black currant marshmallows and delicate almond financiers. The long-awaited opening of Gough’s on Gough seems to have been a blessing in disguise. The service feels as polished as a Michelin restaurant in Paris, while chef Rhodes’ dishes hit the mark one after another, presenting a near-flawless tasting menu from start to finish, a rarity for newly opened restaurants. Chef Arron Rhodes helms the kitchen at Gough’s on Gough. There are a few additional items on the á la carte menu (think Hawkes Bay lamb rump, slow-cooked chicken with spring vegetables and handmade gnocchi), but not enough to rotate through several return visits, which presents a bit of a dilemma for those of us who are already itching to dine again at Gough’s on Gough. Luckily, we hear that chef Rhodes is planning to switch out 1–2 of the dishes on the tasting menu every few weeks or so. At the end of the day, what excites us most about Gough’s on Gough is that it’s truly unlike any other restaurant in Hong Kong. 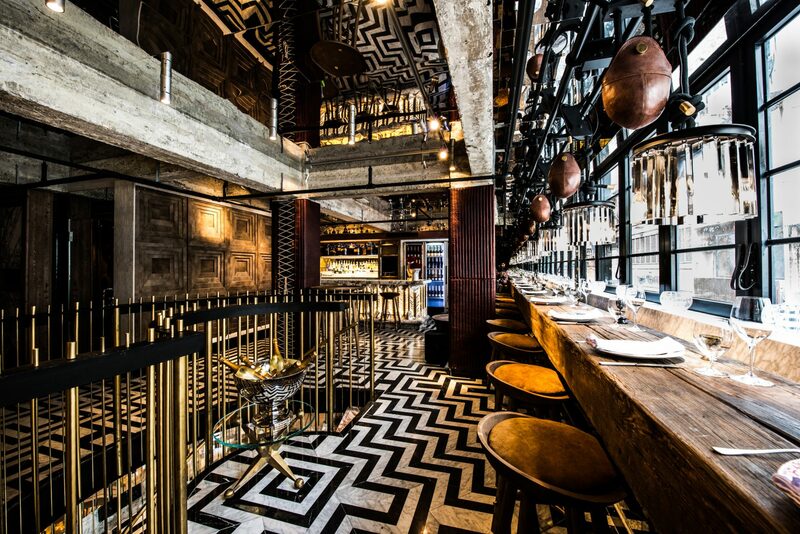 The striking interiors and border-defying menu combine to create an eclectic and sophisticated, modern yet vintage vibe that embodies Timothy Oulton’s brand to a tee — with a strong start out of the gate, here’s hoping it only gets better from here on out.